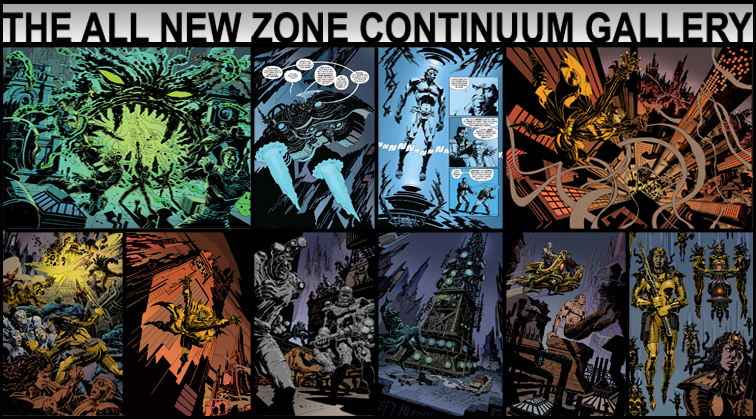 GO TO THE ALL NEW ZONE CONTINUUM WEB SERIES EPISODE 8 IS NOW UP! EVERY TUESDAY AND THURSDAY A NEW EPISODE! 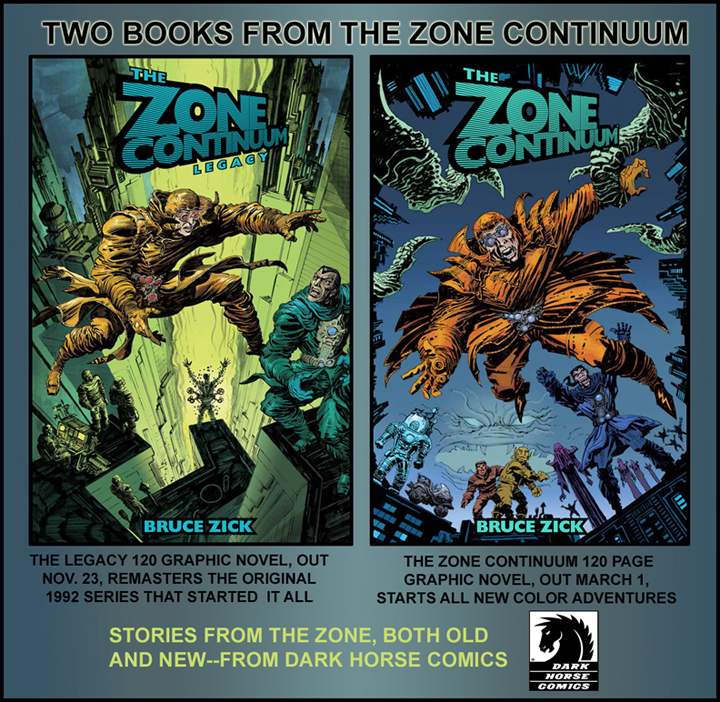 24 years in the making--The Zone Continuum returns in two new Graphic Novels from Dark Horse Comics. 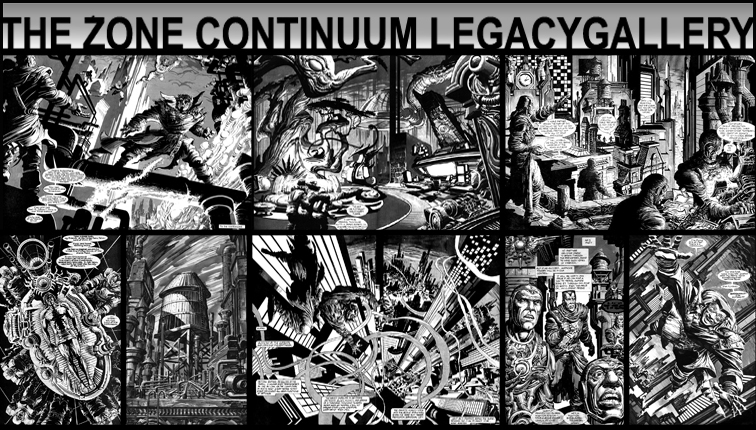 The Legacy edition remasters and reprints the 4 original black and white books. 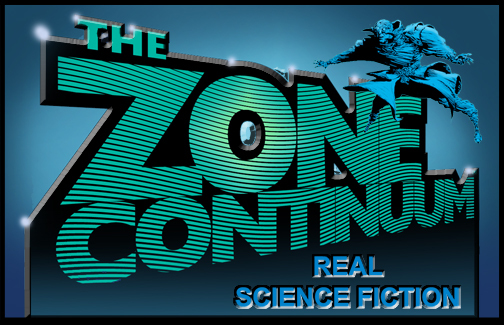 The second novel, The Zone Continuum, contain 4 all new book length stories in full color. Both books are available at your local book store or at the Dark Horse Online Store: Buy the original stories in The Zone Continuum Legacy Graphic Novel Buy all new color stories in The Zone Continuum Graphic Novel Join us at our Facebook Zone Continuum Page and get regular updates, newz, previews, and most critical and insightful self-actualization. A dwindling race of ancients, called the Dar, live on Earth in different geo-magnectic Zones. Each Zone has a unique electromagnetic frquency that is attuned to the Dar living within. If the Dar leave their Zone, they die. But the Zones have become unstable and are shrinking, rising, falling, mutating--making survival more and more difficult. 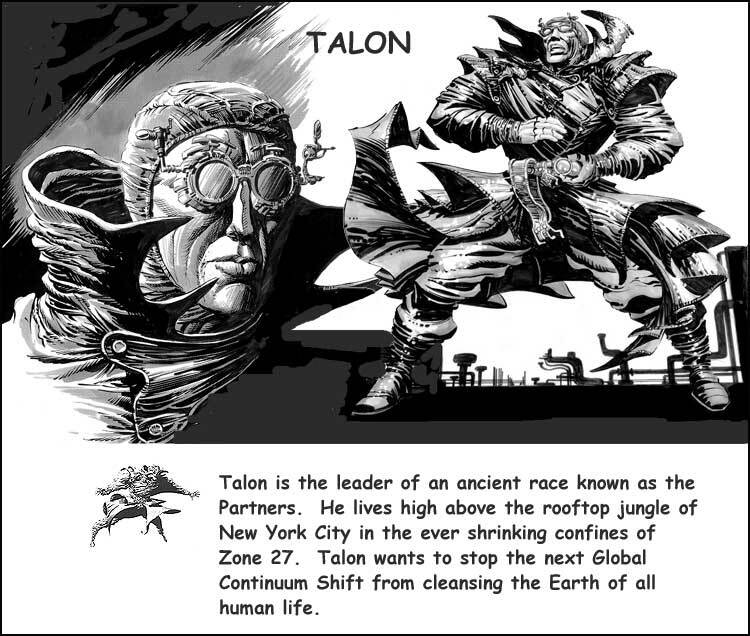 Talon is the leader of the Dar, and lives in Zone 27 in the center of New York City. Because Zone 27 is shrinking and has risen 150 feet above sea level, all the ancients must live high above the streets in the labyrinthine rooftop jungles. Talon lives in a modified watertower called Roc's Nest. His wife, Paris, lives apart from him in the adjacent Zone 26. As the two Zones pull farther apart, so increases their separation and their desperation to find a way to be together again. 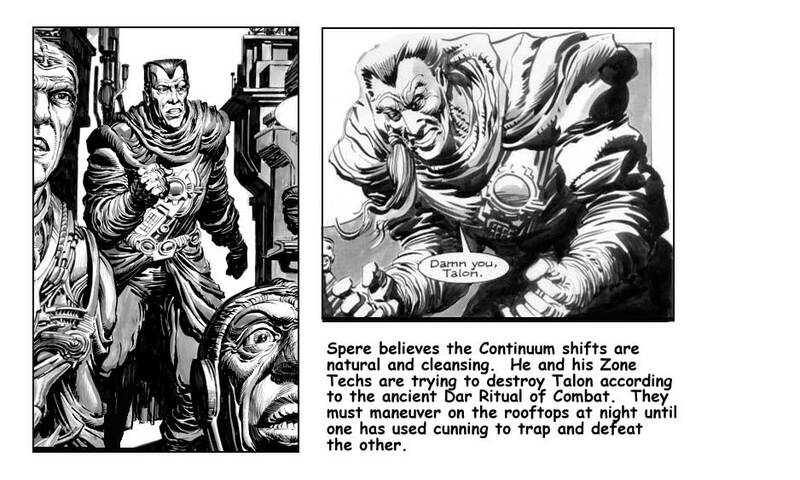 Talon's enemy is Spere, also a resident of Zone 27. They are in a technology race to create ever more advanced weapons and machines to help defeat each other and to survive the ever-mutating and dangerous Zones. Both Talon and Spere are assisted by their Tech Lords who toil in the rooftop Tech Labs. Talon's specially designed Zone Equipment includes Zone Gloves, Goggles, Zone Suit, and Wave Rider Belt, which are linked to the computer banks in Roc's Nest. STILL CONFUSED??? 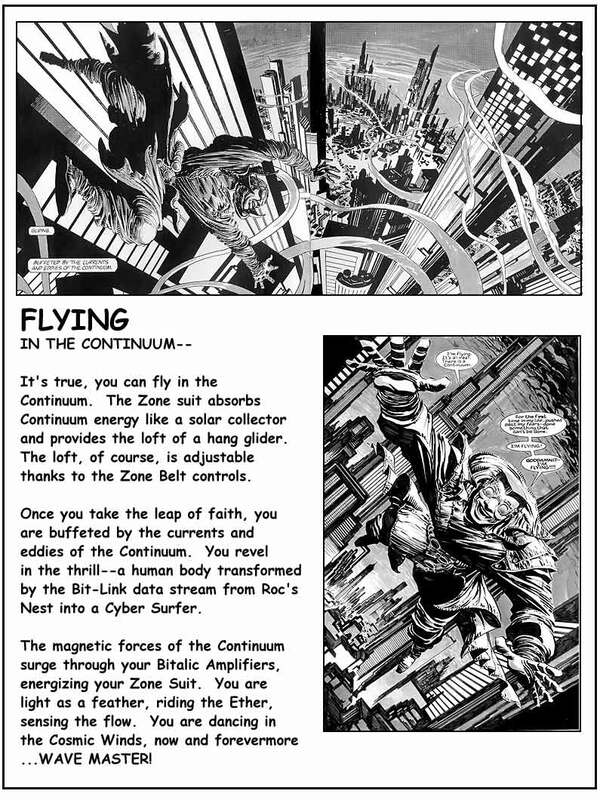 GO TO THE ZONE PRIMER PAGE, IT JUST MIGHT HELP YOU SEE THE LIGHT AND UNDERSTAND THE ZONE CONTINUUM! 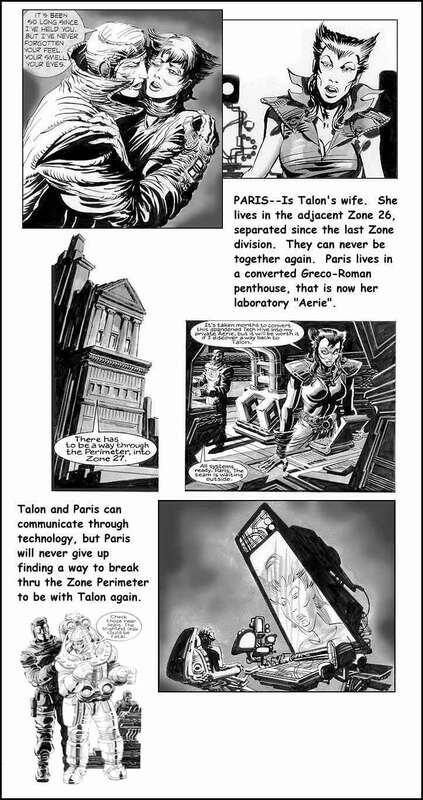 GO TO THE ZONE PRIMER PAGE!! !